Wedding Magic Mirror ‘selfie’ Photo Booth for hire in Nottingham, Derby, Leicester, East Midlands. Hire our interactive magic mirror photo booth for your wedding in Nottingham, Derby, Leicester, and East Midlands. Our Magic Mirror Photo Booth is a unique, interactive, and magical photo experience available across Nottingham and the East Midlands. 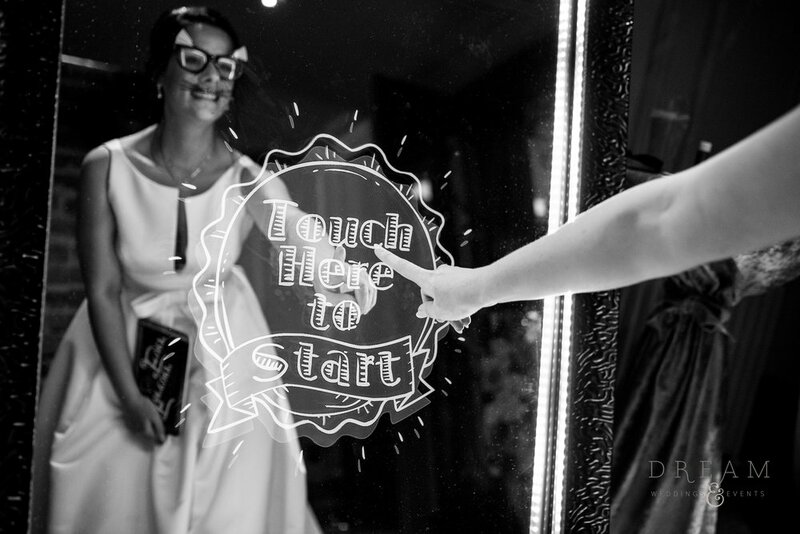 Our Magic Mirror is the latest and most advanced photo booth on the market -a must-have for weddings! It uses custom animations, compliments, touch screen, and sound to engage your guests in this truly magical selfie experience. It is excellent for entertaining your guests whilst creating and capturing memories that will last a lifetime! Not only is the Magic Mirror an amazing experience but it also creates the highest quality photos. The mirror booth uses a top-of-the-range Canon DSLR camera, flash, and a dye-sub printer to create beautiful images every time! Guests can walk away with their photo in under ten seconds after their experience is complete, meaning no hanging around and allowing maximum usage of the mirror! This photo booth is packed full of excellent features. These include touch screen photo signing, emojis, virtual props, filters, a large variety of animations, voice guidance, social media sharing, GIFs, games, video messaging, children’s mode and much more! For each wedding the Magic Mirror comes with a choice of frame, backdrop, decorative lanterns, and crates of custom wedding props to ensure the most luxurious photo booth experience for you and your guests. The mirror can be customised to include your names and wedding date on the start screen along with the option to customise the photo templates, giving an extra personal touch.